Alfred Henry Davenport was born December 5, 1845 in Malden and died June 22, 1905 in Squirrel Island, Maine. He was a man of outstanding ability, integrity and generosity, leading the way not only in response to civic and national need, but in his help to many individuals, for which no one was the wiser. As a young man he worked for a Mr. Baybrook who conducted a small business in custom made furniture. When he died Mr. Davenport took over the business and developed it, making the name of A. H. Davenport Company famous. In fact, later on he received a decoration from Kalakowa – King of the Hawaiian Islands – for his furnishing through-out of the palace of Liliuelalani. So delighted was the queen with his workmanship that she created him Knight of the Hawaiian Islands. He was president of the First National Bank in Malden, succeeding Mr. Elisha Converse. In his daily routine his coachman, Michael McGrath, (father of Frank McGrath, present executive vice president of the Irving & Casson- A. H. Davenport Company) would drive him to the bank and then to East Cambridge where he walked through his factory. He knew all of his workmen and talked with them individually. Swedes seemed to be his preference because they worked carefully and did not rush things. From there Michael would drive him to his office and showroom in Dock Square, on the corner of Washington and Elm Streets, where he sat behind a rail watching everyone in and out. Later he was driven back to East Cambridge and then home. A genial person, Mr. Davenport thoroughly enjoyed meeting and entertaining people, which he did royally. This characteristic was in contrast to his wife’s nature, which was much more reserved and less out-going. Mrs. Davenport was Ella Louise Stetson, born in Boston in 1851, and died in Squirrel Island September 13, 1925. Mr. Davenport was eminent commander of the Beausant Commandry of Knights Templars, president of the Malden Club and president of the Malden Hospital Corporation. He was also a pillar of the First Baptist Church. Before moving to the present Davenport home, built in 1892, the family lived on Berkeley Street, the estate running through to Holden Street, but the house was done away with when the high school was erected. Their summer home was on Squirrel Island where the family gave much pleasure to others through their hospitality both on their beautiful yachts and in their home. Incidentally, Mr. Davenport first met his wife on the boat going to the Island. He was president of the Island Association, gave the Public Library, and was a liberal supporter of it. He likewise gave the stained glass windows in the chapel, the pews and the bell. Politically, Mr. Davenport was a power, although he never held office. A staunch Republican, he entertained Theodore Roosevelt – prior to his presidency – and Henry Cabot Lodge, of whom he was a lifelong friend, in his home at the time of the Blaine Logan campaign. His son, Fred Albert Davenport, who was born in Malden April 19, 1873 and died in Malden July 8, 1928, was an excellent pianist but very shy and would not play for anyone. He succeeded to his father’s business but had not inherited his ability as an organizer and the business disintegrated. Irving and Casson walked out, but finally bought what was left, forming the firm of Irving & Casson – A. H. Davenport Company. Alice May Davenport was born in Malden July 19, 1878 and died in Malden May 16, 1944. She never mixed with people to any great extent, always attending private schools instead of public, and had few close friends. When she and her brother were small and went skating with other children on Saugus Creek, Mrs. Davenport always came down to be sure they did not drown. In 1922 Miss Beatrice Blake, a close and beloved friend for many years, came to live with the family. She was with Miss Davenport when she lost her mother and her brother and remained with her until her death. 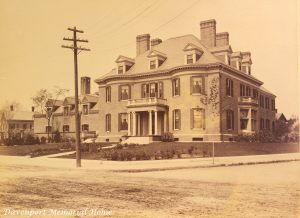 Miss Davenport’s idea of giving her home to the aged was stimulated, if it did not originate in hearing friends talk about the Twilight Home in Quincy. The thought was in her mind for a number of years and she discussed it with Mr. Wiggan – later her executor – and with Mr. White, who drew up her will. She and Mr. White spent a great deal of time studying the reports of the Department of Charities, which contained detailed information regarding the type she desired. Finally she expressed it thus in a letter to Mr. Wiggan dated August 2, 1943:- “In this present will I think I have been able to make that dream of mine come true” and come true it did with the incorporation of the Davenport Memorial Foundation on April 2, 1946. For more information on Mr. Davenport and his furniture business, see Anne Farnum’s article in the May, 1976 issue of “Antiques Magazine”, page 1048.